This should finish my posts from Bonnaroo this year, and start a Friday tradition of posting cocktail recipes. So to start off that tradition, what better than an epic Bloody Mary we served at Bonnaroo. I’m tempted to rename them Bonnie Marys – but I’m afraid that may sound a little too theme-restaurant. On the second day of the festival the members of The Moveable Chef hosted a breakfast for about 20 people. Yes, there was food. Bacon was involved. Fines Herbes may have been used. 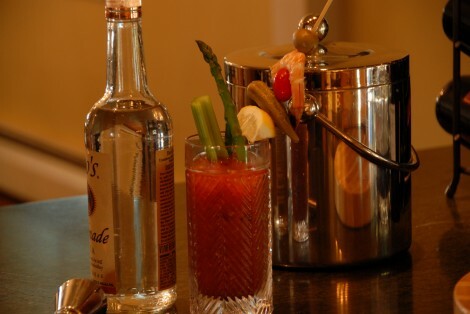 But the big hit was the Bloody Marys, and for good reason – these are extraordinary Bloody Marys. There are some good bottled mixes out there – but nothing I’ve tried comes even close to a freshly made batch. The other element that made the Bloody Marys a big hit was the garnish. A celery stalk is just an edible stir stick – these called for something more. So, each drink got a bamboo skewer with a jumbo martini olive, a boiled jumbo shrimp, a cherry tomato, a pickled okra, and a lemon wedge. This also works well when preparing several, as the skewers can be pre-made so garnishing the drink is fast. Next to the skewer drop in the celery and a stalk of crisp-steamed asparagus. Provide your guests with some condiments such as extra horseradish, Tabasco, Sriracha, lemon wedges, Worcestershire sauce, Old Bay, etc. – but let them know that they probably won’t need much. This is a pretty complete, balanced mix. Also, you may notice that there is no celery salt in the mix. That isn’t an oversight. The first ingredient in Old Bay is celery salt, and I like Old Bay better. I also can’t think of the last time I used celery salt for anything other than a Bloody Mary, but I always have Old Bay on hand. If you want to use celery salt, cut the amount in half (or to taste). I’ve also recorded a video of this recipe, linked at the bottom of the post. Optional garnish: Olive, grape tomato, jumbo shrimp, asparagus stalk, cocktail onion, crawfish – if you can get it on a skewer it’s fair game. Consider this inspiration. Pour over ice, stir, garnish. Mix all ingredients well. The mix is better the next day, and will keep for a few days in the refrigerator. Shake or stir well before use.